The cowgirl above was from my favorite part of my weekend trip to Texas: The National Cowgirl Museum and Hall of Fame in Fort Worth. I wish I could make the picture larger so you could see the detail of her hair blowing in the wind; it’s a beautiful statue. The museum honors the women whose independence, resilience and courage helped shape the American West. 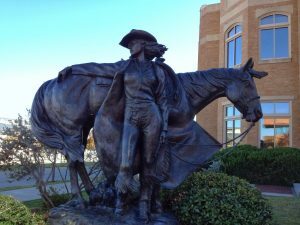 I know it was always one of my dreams when I was a little girl to be a cowgirl (no princesses for me, thank you very much). 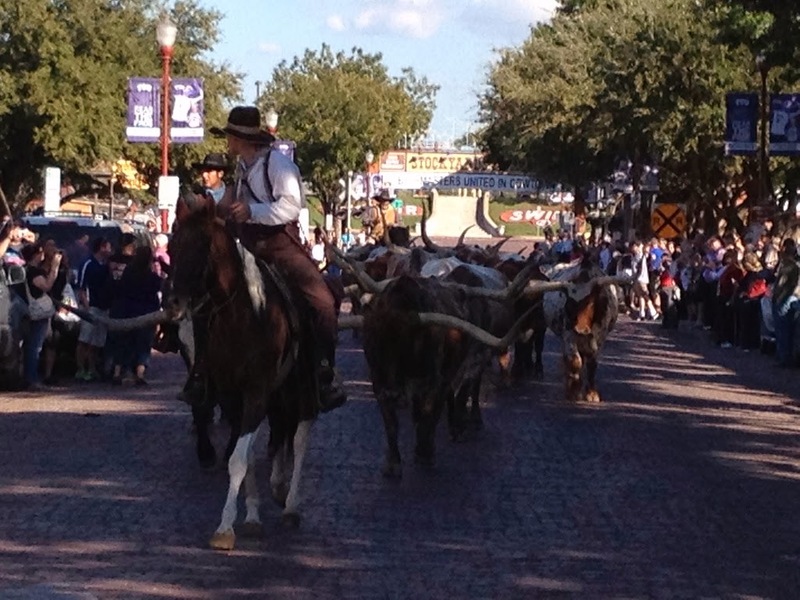 We also got to see some Texas Longhorns at the Fort Worth Stockyards; these guys are HUGE! 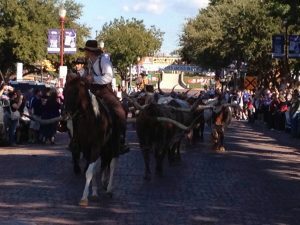 Cowboys wrangled them down the main drag of the stockyards which is an older section of the city that’s been revitalized. It looks just like all the pictures of the old western towns that you’ve seen in the movies. We drove by the George W. Bush Presidential Library and Museum which kind of made me snarkily chuckle, as it’s not like George W. was exactly renowned for his love of reading (although as my friend pointed out, his wife was). We didn’t have the time to go inside, but it was an impressive building and beautifully landscaped. We went to a lot of museums (who knew there were so many museums in Fort Worth? ), went to the stockyards, went to the opening weekend festival in the new Fort Worth city square, went to a party, ate a lot, drank a good amount of wine and talked & talked. I crammed a lot into a long weekend. But the best part of the trip, honestly, was coming home. I always want to get away and travel somewhere else; the grass is always greener, eh? But once I’m there, I realize that like Dorothy, I can’t wait to get back home and be surrounded by my family.